One of the common complaints of novice editors of Wikipedia is the awkwardness of learning wiki mark-up combined with the lack of a visual (WYSIWYG) editor. 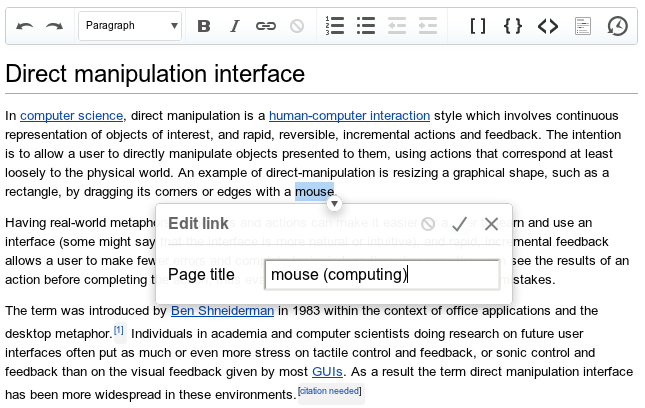 This has now been remedied with the launch of the VisualEditor on the English-language version of Wikipedia (and other sites using MediaWiki, the software upon which Wikipedia runs). However, the editor will initially only be available to experienced users and is turned off by default. However, instructions are provided for enabling the visual editor. At present VisualEditor works in the most modern versions of the Firefox, Chrome and Safari web browsers and support for Internet Explorer (shudder! Ed.) will be investigated in 2013.